One of the ways I like to save money is by doing my own manicures. Ditch the Q-tip and opt instead of an angled eyeliner brush. According to the folks over at Fitness Magazine, a brush dipped in remover is a lot better way to clean up around the edges! Genius! And do you want to know what’s currently hot in nail design? 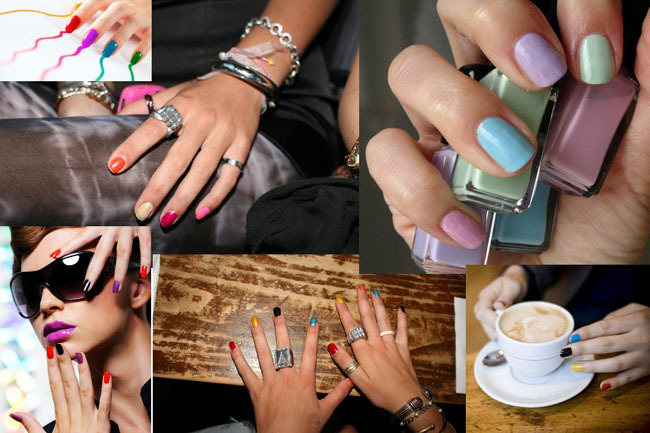 (yes nail design can be just as fashion forward as clothing) Multi hued nails. As in a different color on each nail, kind of like the way we used to do it as kids. Or, if you prefer something a little more subtle, paint four fingers on each hand one color and then pick a second color for the remaining fingers. Check out the photo below for ideas. This entry was posted on July 13, 2011 at 7:44 am and is filed under New Stuff to Try. You can follow any responses to this entry through the RSS 2.0 feed. You can leave a response, or trackback from your own site.